When it comes to running errands as a new mom, you can either dread the process or look very forward to the much needed fresh air to break the occasional cabin fever you experience after having a little one. Another relative topic like all things baby and parenthood, running errands is one of those things we all do differently according to our babies needs and behaviors. Well, I’ll be honest– Cammy hasn’t been completely easy 100% of the time, but for the most part…this kid has been an easy ride when it comes to hitting up the post office, grocery store and even frivolous shopping trips. The tricky thing about figuring out how to run errands with a baby comes down to one main thing– babies CHANGE from month to month and with more hours spent awake, more mobility and more physical independence once they start sitting up, walking, etc– the dynamic of this errand running process can change. *If it rained that day or recently and all of the available carts were outside, you don’t have to worry about drying it off or sticking your baby in a wet cart. *Extreme weather- you definitely don’t wanna stick your baby in a hot metal shopping cart or a freezing one either! *It holds things besides your baby! 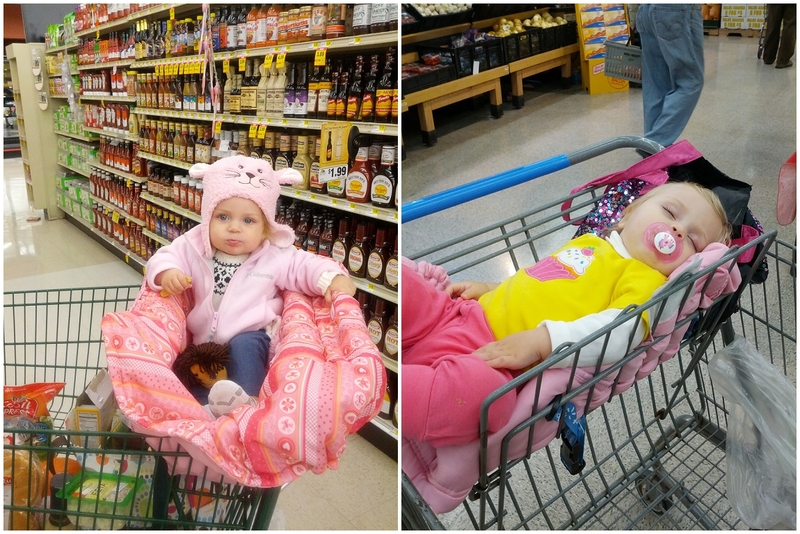 Having a shopping cart cover can allow you to stick their snack cup, juice/bottle and little toys/books for entertainment in there while you shop to buy more time – much better than watching it all fall through the metal bars and having to bend over and pick it up! *Germs- I’m not a crazy scared of germs person because after having a baby and watching them get into everything– they WILL get away with some dirty stuff but it’s nice to have that cart cover for that kind of protection and for yourself because it also goes over the part that you hold on to! And??? Because they double as high chair covers– which you DEF want! 2. Next up: PARK NEXT TO THE SHOPPING CART RETURN! 3. Lastly, this is again, relative– but I think in general it could go across the board for the most part. I try my BEST and always plan to go to the grocery store in the morning. The reason the morning works best for us is because after she’s had breakfast, she’s the happiest and she’s in a great mood about to seize the day. She’s the most agreeable then and well behaved and also, she enjoys having a little mid-morning snack and juice while shopping and the stores are LESS CROWDED. The last thing you want to do with a baby, ever, is wait in line. You can almost feel them becoming anxious sometimes and getting irritated that you’re stagnant. No lines while shopping with baby is a BEAUTIFUL thing! 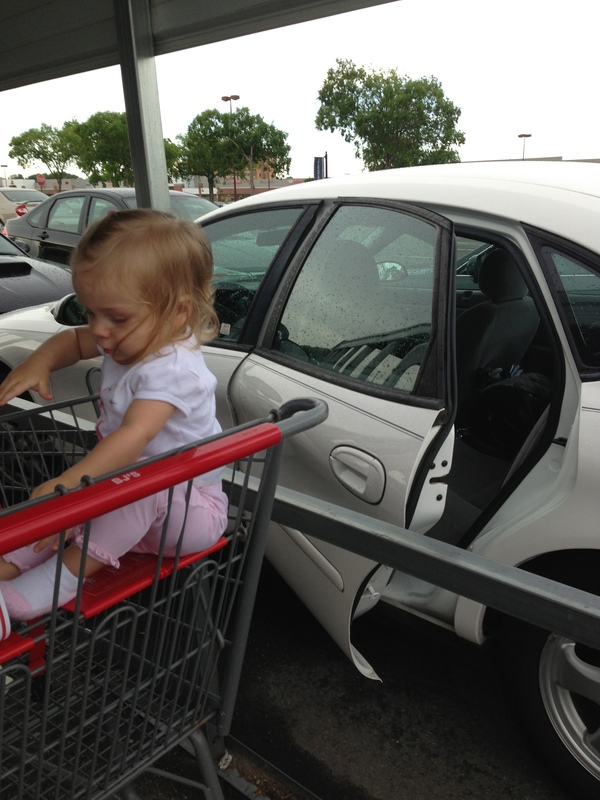 I will never forget my first trip to BJ’s after she was born. I just happened (not planned) to go at 9am when they opened because I had lots of work to do that afternoon, and I saw SO MANY MOMS with very young children! Lots of them with two and it was like a light bulb went off that day– ohhh okay ladies, so THAT’S when you come out and get stuff done with those little ones! So brilliant! It’s also a great time to go because then you get home and babies are naturally worn just from the travel and experience of getting out, that you get them a little lunch and have them play some more and they’re OUT for nap time! My daughter is 5 and we still use the shopping cart cover, it just makes the seat softer for her boney little hiney, it stays in a big 31 tote with my reusable shopping and cooler bags I take to the store in the back of my car.